Successfully Added Deluxe Handsfree Bar Code Scanner for Small Business to your Shopping Cart. Increase productivity and transform your small business or warehouse into an ultra-modern and efficient organization with this innovative handsfree omnidirectional bar code scanner. If you're seeking investment protection and great value in a scanner, then the CVKY-G124 is the ideal scanner for you. This Deluxe Handsfree Bar Code Scanner helps you to better organize and maintain your inventory. This special bar code scanner can read every industry standard product/inventory code you need for product and inventory control (including UPC, EAN, ISBN/ISSN, and many more). How can this Deluxe Handsfree Bar Code Scanner help your small business? Bar code systems provide an array of benefits, including operational efficiency, better customer service, and improved visibility of key business information for management. Information really is your most valuable asset, so you need the most reliable inventory management system available for your budget. 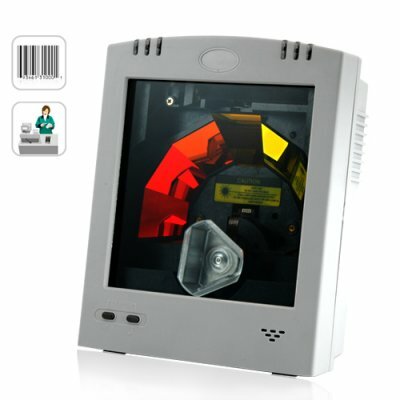 Protect yourself by ensuring you have accurate and instantly available data regarding your product inventory with a Computer USB Deluxe Handsfree Bar Code Scanner. Designed with Simplicity, Quick Implementation and Cost Effectiveness in mind, now the technology companies like Wal-Mart and DHL have been using for years to read codes and track inventory is now available to everyone. Simply connect the bar code scanner to your PC using the USB cable provided and then scan the appropriate UPC code within the instruction manual provided to set your new bar code scanner up for its primary operating mode and you are ready to start using it! Paired with P.O.S. or Inventory Tracking software, you now have a modern-age tool to use for quick and accurate recording all of your product stock and daily transactions. Whether you are looking to save time, prevent inventory loss, track stored product, or reduce costs for manual labor, this Deluxe Handsfree Bar Code Scanner will start saving you time and money from the moment you start using it. This new barcode laser scanner makes a great addition to internet storefronts, webshops, and dropshippers that like to deal with small business customers. Feature it on your new product page to generate some new sales and nice profits while helping a small business become more self-sustaining and efficient. Available in our warehouse right now, so place your order today and we will ship it out tomorrow. A Bar code readers eliminate the need for manual entry of inventory data and turnover. It is proven to be very efficient in inventory control as well as shipping and receiving, point of sale transactions and container tracking. Just like most electronic consumer products, if you spend some time in the beginning learning how to operate it (and reading the manual), then you will be able to operate it expertly in just one afternoon.